I have a strong liking for carrots right from my childhood days. 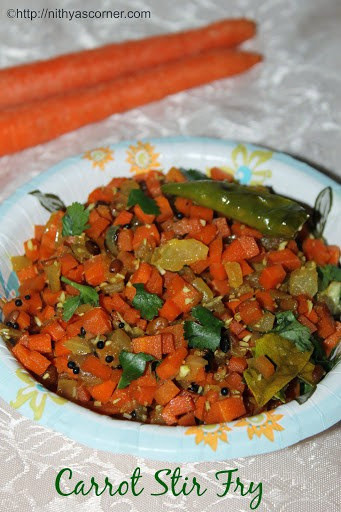 When I have surplus carrots at home, I make this Carrot Stir-Fry and Carrot Sambar often. I hardly see people who do not like carrots. For Sanvi, I make Carrot Cupcake often. She just loves it. When I am too lazy to cook elaborate meals, I make this simple and easy Carrot Poriyal. It goes well with Capsicum Sambar, Paruppu Rasam, and Oats Curd Rice. Most of the times, I will not add coconut but when I have guest at home, I will use coconut. Onion (Chopped) – 1 medium no. Green chillies (Slitted) – 2 nos. 1. Chop the carrots finely and set it aside. Heat oil in a pan and add mustard seeds. When mustard seeds splutter, add urad dal and gram dal and fry till golden brown. Then add chopped onions and green chillies. 2. When onions turn transparent, add chopped carrots and sauté for 2 minutes. Then add turmeric powder, curry leaves, and salt. Mix well and fry for two minutes. 3. Sprinkle 2 tablespoon of water. Cover the pan and cook for 3 more minutes. Now open and mix well. 4. Reduce the flame to medium-low and add grated coconut. Cook for a minute and then add coriander leaves. Give a quick stir and switch off the stove. Now, Carrot Stir Fry is ready! 1. Adding grated coconut is optional. Most of the times, I do not add them. 2. You can add chilli powder instead of green chillies. 3. Do not add water more than required and cook closing the pan. Carrots could turn very soft or even mushy. 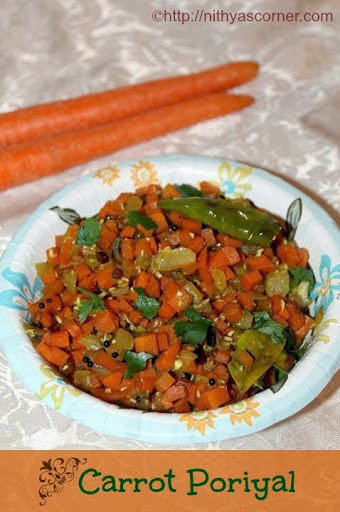 This entry was posted in With Coconut and tagged Capsicum Sambar, chopped carrots, coriander leaves, Curry Leaves, Paruppu Rasam on November 22, 2014 by vikashbhardwaz. A healthy and tasty sambar! I have the Capsicum Sambar along with hot rice, idly, and dosa. I learned this simple recipe from mom’s corner. Thank you for sharing this recipe. My family liked it so much. The sambar is full of capsicum flavor. It tastes so well. I will make this sambar atleast once in a month. Chopped tomato – 1 no. Curry leaves – 5 to 6 nos. 1. Pressure cook 1/4 cup Toor dal and 1/4 teaspoon of turmeric powder using 1 cup of water for 3 whistles. Once the pressure is released, mash the cooked dal and keep it aside. 2. In a pan, heat oil. Add mustard seeds and let it pop out. Now, add fenugreek seeds and once it splutters, add capsicum pieces. Fry until capsicum is half cooked. Then, add tomatoes and asafoetida. 3. Add tamarind paste, sambar powder, and salt. 4. Add toor dal and boil for 5 minutes. Finally, add curry leaves and boil for 2 more minutes. Now, the Capsicum Sambar is ready!!! This entry was posted in Sambar and tagged Capsicum Sambar, Curry Leaves, Fenugreek seeds, Sambar powder, Turmeric Powder on November 22, 2014 by vikashbhardwaz. 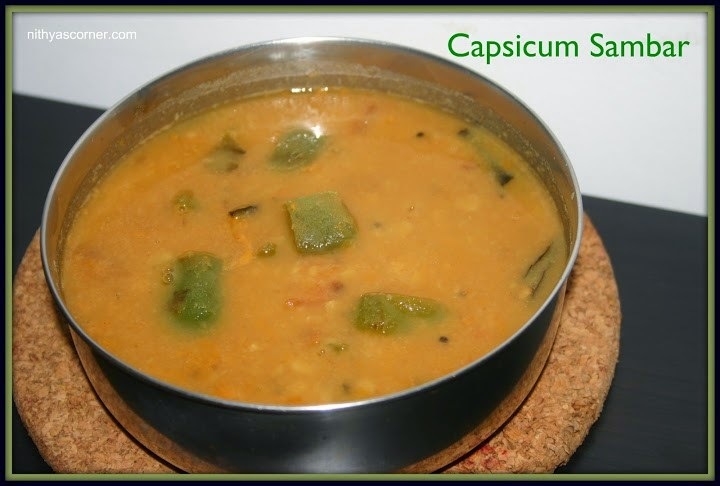 This entry was posted in Recipes for Onam Sadya | Onam Recipes and tagged Capsicum Sambar, Curry Leaves, Fenugreek seeds, Sambar powder, tamarind paste, Turmeric Powder on November 22, 2014 by vikashbhardwaz.